This laboratory exercise covers the following animals. You should learn this classification scheme and be able to classify the animals into these categories. Segmented animals have repeating units. This has led to specialization of parts over evolutionary time because the different segments could become specialized for different purposes. Notice the variety of specialized structures near the anterior end of the clam worm in the photograph below. Molecular data suggests that segmentation evolved independently in the annelids, the arthropods, and the chordates because ancestors to each of these three groups were not segmented. Annelids are bilateral, coelomate protostomes. The coelom is partitioned by septa (crosswalls). The fluid-filled coelom acts as a hydrostatic skeleton. When the circular muscles that surround each segment contract, the segment becomes thinner and longer. When the longitudinal muscles that extend from one end of the segment to the other contract, the segment becomes shorter but thicker. Because muscles can only contract and cannot lengthen, other muscles are used to lengthen them. In annelids, when circular muscles contract to lengthen the segment, the longitudinal muscles are lengthened. When the longitudinal muscles contract to make the segment shorter and thicker, the circular muscles become lengthened. Setae are bristles on the skin that anchor or help move the animal. Movement occurs when waves of contraction of longitudinal muscles cause a “bulge” to progress from the anterior end to the posterior end. Annelids exhibit specialization of the digestive tract. Some of these structures are the pharynx, crop, gizzard, intestine, and accessory glands. Annelids have a closed circulatory system. A pair of cerebral ganglia function as a simple brain. A ventral nerve cord extends the length of the animal and connects to a pair of fused ganglia (mass of nervous tissue) in each segment. The ganglia within each segment function to coordinate muscle contractions. Examine the exterior of an earthworm and find the ventral surface. Place the worm in a dissecting pan with the ventral surface down. Identify the clitellum. This structure produces mucous needed for reproduction. Find rows of setae along either side of the ventral surface. These help provide traction as the animal moves through the soil. Find the dorsal blood vessel. This structure should be visible through the body wall and will appear slightly darker than the rest of the body. It extends the length of the animal. With a scalpel, make a shallow cut along the dorsal surface beginning at a point approximately half way between the clitellum (see photograph below) and the posterior end and ending at the anterior end. Try to avoid cutting the dorsal blood vessel by keeping your cut to one side of the vessel. Try to cut only the body wall but not the internal structures. The septa between each segment will prevent you from spreading the walls open to view the interior structures. Use a needle or scalpel to carefully cut the septa while spreading the body open. Pins can be used to hold the body open. Find the structures shown in the photographs below. Be sure that you understand the function of each of these structures. Figure 2. The anterior end of this earthworm is on the right. Use a needle to cut the septa in the region of the intestine and roll it aside to expose the nerve cord underneath. 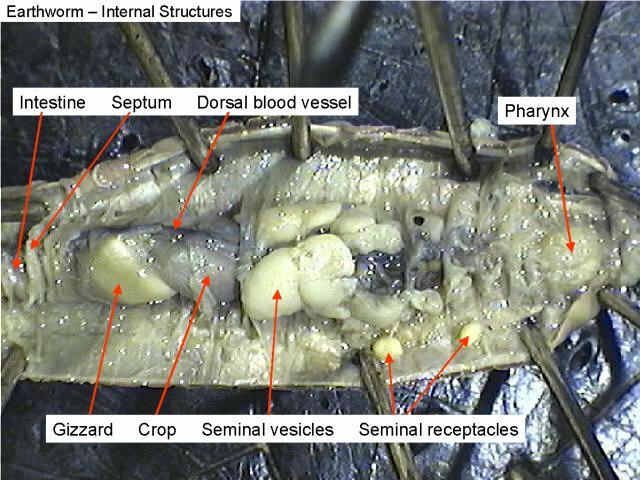 Examine a labeled earthworm composite. This slide shows three different cross sections. The cross-section on the right side of the slide is from the intestinal region. Identify the intestine, typhlosole, coelom, nephridium, longitudinal muscles, circular muscles, and dorsal blood vessel. Are any setae present in the cross section? Most leeches are freshwater predators or parasites. Parasites have oral and posterior suckers used to attach to the host. Bloodsucking leeches produce hirudin, a powerful anticoagulant, in their saliva. When surgeons reattach severed human fingers, they occasionally use laboratory-raised leeches during the patient’s recovery. The leeches remove blood from the tissues around the reattachment sites, release anesthetics and anticoagulants, and thereby relieve pressure and decrease pain. Removal of fluids from the area by the leech enables fresh fluids to move into the area. 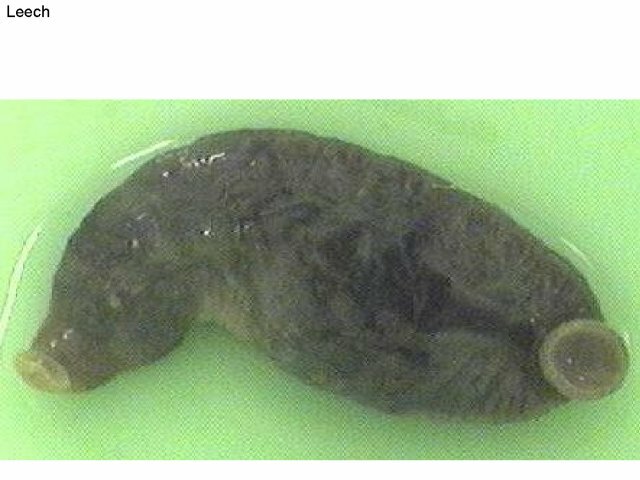 The largest class of annelids is polychaeta. Polychaetes have parapodia, fleshy, paddlelike lobes on each segment. Parapodia function in locomotion and gas exchange. Setae are located on the parapodia. Many Polychaetes are predators. Tubeworms are sessile filter feeders that live in tubes constructed from sediment from the ocean floor. Cilia on their tentacles create water currents that enable them to filter food from the water.